In Stock, Limited Quantities Available, Order yours today!! Priced at $599 Unbelievable Price!!!! 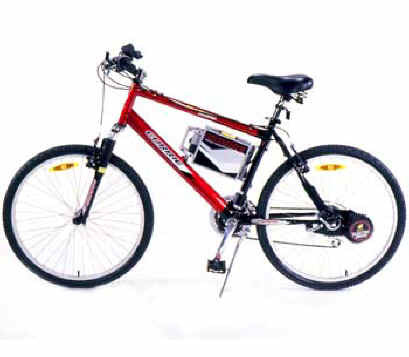 The 2003 E-BIKE mountain bike is our high end electric bike and the ultimate performance vehicle. Its a 21-speed mountain bike equipped with top-end performance equipment and our high-end high-torque motor. Combined with our 12 amp-24 volt battery system, this bike can reach speeds up to 18 MPH for durations as far as 25 miles on one charge. Get this high-end electric bike today and by the envy of your neighborhood. This is an UNBELIEVABLE deal!!!! Order yours today to guarantee delivery. Motor Exclusive Finned Hi-Torque Electro Drive, 24-volt brushless DC motor with built-in electronic pulse-width modulated (PWM) controller that includes low voltage battery protection, motor overheat protection, peak amperage protection, stall protection, maximum speed protection, brake inhibit and pedal torque enabler.